Conservation – Believe it or not, but hunting deer is necessary for the health and stability of our deer populations. When you hunt deer, you help balance wildlife populations and make sure that future deer can live a full and fruitful life. Natural Meat – When was the last time you ate natural meat that you are 100% confident has not been force-fed vitamins and unnatural supplements? For many of us, we are happy to grab this hormone-feed meat from the grocery store shelf, but for others, we want to know exactly where it came from. In this case, it comes from your own two hands. Being One with Nature – When you hunt for deer, you are communing with the natural world. As a hunter, you are an actual participant in the food chain, as well as the circle of life. You also get to understand the struggle of finding food that our ancestors knew all too well. Experience the world of deer hunting when you sign up for guided deer hunting trips from the Cedar Knoll Hunting Lodge. We offer unique hunting opportunities on private land, allowing you to hunt without having to worry about other hunters ruining your trip. This entry was posted in Uncategorized and tagged Guided Deer Hunting Trips on November 24, 2017 by 15803827. Heading out to hunt by yourself is great, but every once in a while you want something different. Why hunt in a shared space with others when you can enjoy a hunting trip on a private piece of land with just you and your close friends. The Cedar Knoll Hunting Lodge is proud to offer guided hunting trips with services that you will not find from other lodges in the South Carolina area. Hunting on private land is very different from hunting in a public area. When you book a trip to our lodge, you will be able to hunt on 3,000 acres of game-rich land without having to worry about competing with other hunters. Deer hunting season lasts until January, so you will be able to head out on our land, hunt for one of these majestic creatures, and enjoy downtime at our fantastic lodge. Due to our year-round supplemental feeding program, we have one of the highest concentrations of whitetail deer in the US. Contact us today to learn more about our guided hunting trips. In addition to deer hunting, you can visit us for hog and quail hunting trips. We are located near the Savannah River, in the middle of the South Carolina Lowcountry. This entry was posted in Uncategorized and tagged guided hunting trips on November 17, 2017 by 15803827. Check Your Supplies – Whether you are an avid hunter or not, it’s vital that you make sure your hunting inventory is ready for your trip. You’ll want to ensure that all of your hunting apparel is in good shape, that any items you depleted on your last trip are replaced, and that you have replaced anything you may have taken out on your last trip. Upgrade Your Hunting Knives – When was the last time you have purchased a new hunting knife? While we realize that having a good, old reliable selection on hand is great, many new choices on the market are sure to take things to the next level. Take a trip down to your local sports or hunting supply shop and see what they have in stock. Visit Your Regular Spots – If you like to hunt in the same spot every year, it is a smart idea to visit the area to see what is happening there. You can setup your blind so that it’s ready for opening day, check out what kind of activity is going on in the area, and claim the spot so no other hunters take your place. When you want to go on a unique hunting adventure, you can visit the Cedar Knoll Hunting Lodge. We offer guided hunting in South Carolina on private land that is ideal for hunters of all experience levels. This entry was posted in Uncategorized and tagged Hunting in South Carolina on September 21, 2017 by 15803827. Going hunting on your own is great, but if you are a beginner, it is in your best interested to go on guided hunting trips. There are many different benefits to heading on these trips – you can learn from the experts, hunt with your friends and family members, and be out in the woods without having to worry about other hunters getting in your way. One of the best aspects of a guided trip is you can increase your success rate and trophy quality! When you go out on a hunting trip with us, you are hunting on completely private land. This means that you will have a better chance of locating a deer, giving you an opportunity to find a better trophy deer. Our experts will be able to direct you to the places where you are more likely to find a deer. Once you find one, you’ll be able to take the time necessary to take a shot at the deer without worrying about someone taking it from you. Are you ready to start your own hunting trip? The Cedar Knoll Hunting Lodge offers exciting trips in South Carolina. 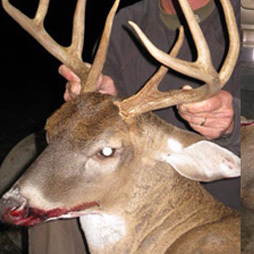 We offer deer hunting opportunities, as well as hog and quail hunting. Call us at (844) 868-5348 for more information about our lodge. This entry was posted in Uncategorized and tagged guided hunting trips on September 12, 2017 by 15803827. Arrive on Time – Whether you realize it or not, hunting is all about being at the right place at the right time. It is vital that you arrive at your designated location at the agreed upon time. When you arrive at the right time, you are more likely to find the animals that you are hunting. Always Be Prepared – Those of us who were in scouts know the importance of always being prepared. Spend time getting your pack together and do your homework before heading out to show everyone in your party that you are serious about hunting. Show Appreciation to Those Who Help – One aspect of hunting that people often overlook are building bonds and making sure that everyone has a good time. When you are polite and show appreciation to the people who are helping you on your hunt, you can guarantee that you will have a good time. Are you ready to go hunting in South Carolina? Head out on a unique and exciting guided hunting trip when you plan your next trip to the Cedar Knoll Hunting Lodge. This entry was posted in Uncategorized and tagged Hunting in South Carolina on August 31, 2017 by 15803827. Visit a Shooting Range – One of the best places to learn about shooting a rifle is your local hunting range. Many local ranges provide gun training and safety courses, helping people of all skill levels improve their shots. Ask a Friend or Family Member – Do you have a good friend or family member who loves to hunt? If you are too embarrassed to ask a stranger for hunting lessons, you can most certainly ask someone you already know. They can share tips and tricks with you, as well as go to the shooting range with you to show you what you need to know. Watch Gun Training Videos – There are many different gun training videos available online to help you learn how to properly shoot a gun. Take some time and do some research to make sure you are watching a video that will provide you with valuable information. Start hunting today when you schedule a guided hunt at the Cedar Knoll Hunting Lodge. Our lodge offers unique South Carolina deer hunting opportunities for individuals who have just learned how to shoot a rifle, as well as people who just want a distinct hunting experience. This entry was posted in Uncategorized and tagged South Carolina deer hunting on August 18, 2017 by 15803827. Treat Every Gun as if It Were Loaded – One of the golden rules of gun safety is to treat every gun like it’s loaded. If you find yourself handling a gun you are unfamiliar with, you won’t know if there are any issues with the weapon. Being safe and smart about your guns is wise. You don’t want someone to get hurt just because they are goofing off with a gun. Show respect to these powerful tools. Don’t Point Your Gun at a Person – It doesn’t matter if you know that the gun is not loaded and the safety is on, you should never point your gun at anyone. It’s aggressive and just in poor taste. There have been far too many fatalities just because someone was playing around with a gun and not being respectful to their friends. Keep Your Finger off the Trigger until You Want to Shoot – Not only should you never point your gun at anything you don’t intend to shoot, you shouldn’t put your finger on the trigger before you intend to use it. Being mindful about pulling the trigger saves lives. Be prepared to go on a guided hunting trip when you come to the Cedar Knoll Hunting Lodge. We are happy to offer hunting in South Carolina on our private land. This entry was posted in Uncategorized and tagged Hunting in South Carolina on July 26, 2017 by 15803827. Don’t Worry about Finding Matching Gear – Did you find a camo jacket that you like at a price that can’t be beat but the matching pants are too expensive? We have good news for you! Animals do not care if you wear matching brands. Feel free to match up a great jacket with a pair of pants from a different maker. Shop for Other Outdoor Clothing – Did you know that camping, hiking, and other outdoor gear companies make selections that look exactly like standard hunting gear but are available at a lower price? Take a look at your local camping and sporting goods store and you may be surprised at what you find in the non-hunting sections. Shop the Clearance Rack – There is nothing wrong with heading right to the clearance rack when seeking hunting gear. If you spend some time looking all year long – particularly after hunting season – you’ll have no problem finding jackets, pants, and more at a price that won’t break the bank. Once you have your hunting gear together, book a guided hunting trip at the Cedar Knoll Hunting Lodge. We are proud to offer exceptional South Carolina deer hunting opportunities. This entry was posted in Uncategorized and tagged South Carolina deer hunting on July 19, 2017 by 15803827.